Sterling Children's Books, 9781454923589, 40pp. What's a superhero without a sidekick? This delightful follow-up to the popular Puddle Pug brings back that perfectly THUNDER-ful pug-and-pig pair: Percy and Petunia. Percy the Pug and Petunia the pig are the very best of pals . . . until Petunia wins a blue ribbon at the county fair. Suddenly, she has no time for hide-and-seek or lapping puddles, cheek-to-cheek. 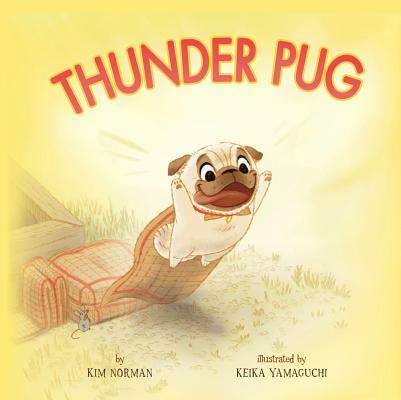 But when Percy finds a faded comic book in a puddle, the lonely pug dons a cape and takes on a new persona: THUNDER PUG Even though being a superhero is exciting, Percy knows he's missing something. Only when "Pink Lightning" (aka Petunia) joins him, and the two are "side by sidekick" again, are they truly living the heroic life. Kim Norman is the author of several children's books, including The Bot that Scott Built; This Old Van; Ten on the Sled; If It's Snowy and You Know It, Clap Your Paws! ; and Crocodaddy (all Sterling). Learn more at kimnormanbooks.com. In addition to her personal website, Kim runs a popular site authorvisitsbystate.com, a portal connecting schools and authors. The site logs more than 40,000 unique visitors annually! She and her husband live in Smithfield, VA. Keika Yamaguchi has illustrated several children's books including Puddle Pug by Kim Norman and Teeny Tiny Toady by Jill Esbaum (both Sterling). She works as an artist at DreamWorksTV, and has previously worked for Walt Disney Imagineering and Disney Publishing Worldwide. She resides in Los Angeles with her husband and three furry children. Visit keikashouse.com to see more of her work. Follow her @KeikaYamaguchi.